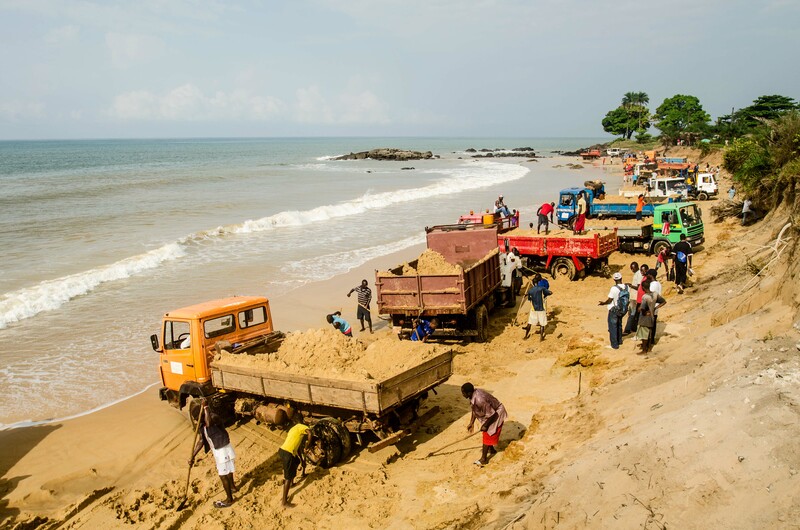 Round-the-clock sand-mining on beaches within a few kilometres of Sierra Leone’s capital Freetown is having a devastating effect on the coastline, destroying property, and damaging the area’s hopes of a tourism revival. “When they take sand from one part of the beach it upsets the balance, and triggers a direct hit on the coast,” he said. In the village of Lakka whole stretches of coastline are littered with the remains of buildings whose foundations have been washed from underneath them as a result of sand-mining. Many coastal residents can only watch as the coastline draws ever-nearer to their homes. Balu Kargbo lives just a few feet away from a cliff of loose sand at the edge of Hamilton Beach, 8 km from Freetown. She is very concerned about the threat to her home but, like her neighbours, she cannot afford to move. “The beach is getting shorter all the time,” she says. Since then, the cliff has receded another five metres. If the erosion continues at the same rate, the building is unlikely to last more than two years. Eimer Peters is the community development coordinator of Tribewanted, an eco-tourism project on nearby John Obey beach. As well as employing over 20 people, Tribewanted has built toilets and a well, and paid ‘goodwill’ money to the community, which is used, among other projects, to pay teachers’ salaries at the local school. But there are concerns that the sand-mining is jeopardizing the village’s hopes of attracting tourists. The deep rumble of the trucks can be clearly heard through the night while new rocks have appeared on the beach as the sand is stripped away. The neighbouring village of Bureh has long been a magnet for Freetown residents looking to take a break from the city. Consequently, a decision was taken not to mine sand there. But the effects of sand-removal from nearby John Obey have had a dramatic effect on the beach at Bureh - already fewer visitors are coming from Freetown, said Peters. “The sea turtles didn’t come either this year,” she added. More than 60 percent of Sierra Leonean youth is unemployed, the country’s National Youth Commission said in a recent report. The miners point out that many infrastructure projects which contributed to the recent re-election of President Ernest Bai Koroma are dependent on the supply of sand. “Without sand-mining there is no building,” said Samba Jalloh, a truck driver. Bangura noted the relationship between development and sand-mining. “The moment we started developing, we began to lose our sand,” he told IRIN. Ten years after the end of the civil-war, construction is booming in Sierra Leone. According to the EPA, sand-mining is currently supposed to be banned on all beaches apart from John Obey. But the ban is flouted openly and on a massive scale. Even if a local ban is enforced, the mining simply goes ahead after dark. “The police work 9am-5pm, so most of the mining now happens at night,” said Bangura. Vested interests are hampering efforts to address the issue: Miners need the work, local chiefs are said to be getting rich taxing the sand, and construction companies need a steady supply to continue their work. He sees providing alternative employment as the key to stopping sand-mining. Projects are already under way to create more sustainable jobs for young people on the peninsula, but mining pays well, and progress has been slow. 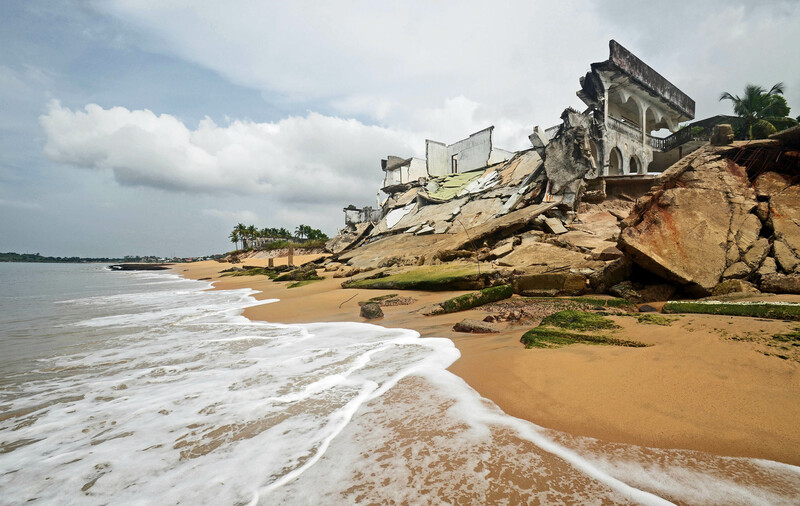 Bangura is hopeful however that, in time, coastal communities will realize the importance of preserving their beaches, and says he is already seeing a shift in perception, as evidence of the destructive effects of the mining becomes palpable. “Now that people can see the impact, the pressure is starting to come from local communities, not just agencies like before,” he said.